The Locust Borer is so-named because its primary target is Black Locust trees. Mature larvae are 25 mm long and white with dark heads. Adult beetles are about 18 mm long and black with bright yellow bands across the thorax and wing covers. The third band on the wings forms a “w” design. Beetles emerge in late summer and early fall and are commonly seen on goldenrod flowers. In the fall they deposit eggs in crack, crevices, and bark wounds. Newly hatched larvae immediately bore into the tree and winter in the inner bark. 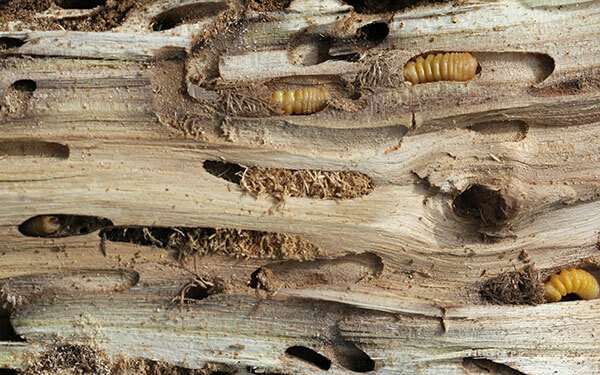 Larvae tunnel in the sapwood and heartwood throughout the following spring and summer. There is one generation per year. By spring, entrances to the larvel tunnel are marked by sap oozing from the tree and granular exudate pushed out by the larvae. Larval mines can literally “honeycomb” both sapwood and heartwood, weakening the tree and making it subject to windthrow. Borer damage also provides an opening for infection by heart rot fungus (Fomes rimosus). This fungus weakens and can kill black locust.